Home / Digital Marketing / Should you hire an SEO Consultant or a Digital Marketing Manager? What is the difference between an SEO consultant and a digital marketing expert? When it comes to outsourcing your website to an agency which is the best choice? When you decide that it’s time to enhance your online presence and gain from the many benefits the Internet has to offer, then the next question you should answer is whether you should hire an SEO consultant or a digital marketing expert. For many people the difference is unknown but in order to help you take better decisions, let me explain a couple of basic things. What is the difference between an SEO consultant and a Digital Marketing Manager? The first thing to understand is that it does not necessarily mean that there is a difference between an SEO and a digital marketing expert. In many cases both will perform the same functions and have the same skills but they may use different titles mainly for marketing purposes. Before getting into why they may do that, let’s see what the theory says. An SEO consultant is someone that has the necessary skills, knowledge and experience to optimize your website for search engines and improve your position in the search results. To do that he/she will use search engine optimization techniques and practices. The ultimate goal of an SEO consultant is to increase the web site traffic. 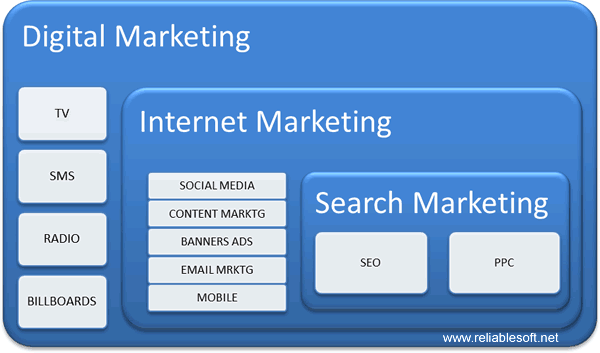 If you take a look at the diagram below you will notice that SEO is a subset of digital marketing and that a true digital marketing manager will have to manage many other areas besides SEO, for example content marketing, social media marketing, email marketing, mobile marketing, banner advertising etc. So by definition the difference between the two is that the SEO guy only cares about getting more organic visits and the digital marketing guy looks at the complete online presence of a company which goes beyond SEO. In the real World the theory is different from what is actually happening and this is exactly the case with SEO’s and Digital marketing experts. In the majority of cases a good SEO consultant will also take care of all the components of digital marketing. They may use the title SEO consultant because for the majority of people this is more understandable than the more sophisticated term of a digital marketing consultant. Take for example our case, while we offer a range of digital marketing services we still name our services page SEO Packages because this is what our customers use to find us in Google. They may use this term but what they want in reality is not just seo but a number of other services and this is what we offer them. If we forget about the different titles for a minute and concentrate on the actual functions, it is clear that in order to succeed online you need to do much more than plain SEO. In the past SEO was enough but with the growing use of social media and mobile phones, if you want to have a proper online presence and get to your customers before your competitors then you need to have a solid digital marketing strategy. Is SEO dead? By all means NO, SEO is not dead and it will never be. The only difference is that now you need to take care more things and not only SEO. When I refer to SEO I am not talking about buying/building/exchanging links for the purpose of manipulating search engine rankings; this is not SEO but spam techniques made by spammers. SEO is about building high quality websites that are user friendly but also understood by search engines. So who should you hire? You need to hire someone that is capable of promoting your business online by taking advantage of all available tools the digital World has to offer. It doesn’t matter if that someone is called an SEO consultant, Internet marketing expert or digital marketing manager; what it matters most are the skills and experience they have and of course the results they can produce. When it’s time to make the decision for hiring a consultant or agency to promote your business online there are a few questions you should ask your prospective business partners. What is their working experience with SEO and Digital Marketing? – Ask for live examples, case studies or testimonials about their work. In addition you can ask for how long they have been working online and details about their academic background, qualifications etc. Ask for the techniques they will use to promote your web properties – What SEO techniques they will use, how are they going to utilize all digital marketing components (content marketing, social media, email marketing, mobile marketing) and how will this benefit your company. Ask them if they can guarantee you first position on Google – That’s a tricky question to ask but a good consultant will never guarantee that. For example what we guarantee and offer money back is increase in your overall website traffic but we never guarantee you first positions even if at the end we manage to do that. If they don’t offer such a service you can agree with them to do something that will not cost a lot of money (maybe ask them to do a competitor analysis report) but will give you an idea of how committed they are with deadlines and the quality of their work. If you are living in a perfect World where everybody is knowledgeable about the latest trends in digital marketing then you should hire a Digital Marketing Manager. According to the theory that person or company should be in position to manage and take advantage of all digital marketing opportunities. In the real World though not everyone is up-to-date about what is happening in the online World so they still use the term SEO to find consultants but what they actually need is a consultant that will do more than SEO i.e. a digital marketing manager. For the purpose of speaking the language of the users some agencies (like our agency) still use the terms SEO for their digital marketing services. Regardless of the terminology and titles what is more important at the end of the day is the result and benefit for your company from whoever consultant this is coming. Personally, I think hiring a digital marketing manager will yield longer results. However it is important to understand and implement SEO techniques to effectively launch your digital campaign. You can have amazing digital information but without properly promoting or SEO optimizing your stuff it’ll just sit out there among the other millions of websites. Great article! Thanks for your description regarding seo and digital marketing. is it ok to learn digital marketing and work through. Please suggest me am confused !!! Digital marketing manager also needs the knowledge of SEO technique.